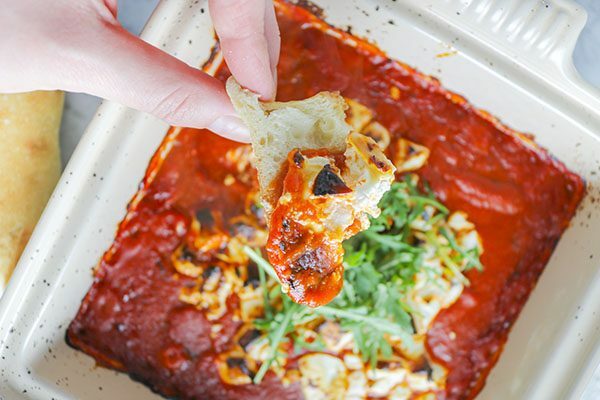 This Baked Goat Cheese Marinara Dip is 100% the easiest appetizer you will EVER MAKE! Its literally TWO INGREDIENTS! Goats’ Cheese… and Marinara. CRAZY. I KNOW. Having said that – you will be awed by how delicious it tastes and impressive it looks. I don’t know about you all – but I am definitely a Type A personality. I like having a plan. I like knowing what is happening when, making lists, checking items off as I go – all the good stuff. That’s why I find it extremely frustrating when I run OUT of time unexpectedly. Just last weekend, we had plans to go to a friend’s for dinner and I was supposed to bring an appetizer. I had all my ingredients prepped and ready to go, a timeline planned out… BUT then I got out of work late. The. Worst. Now, do I make the appetizer and then show up late? Do I arrive empty handed? Do I go to the store and buy something pre-made (GASP!)? In my opinion, none of these are great options. If only there was a easy, impressive looking and tasting appetizer that I could throw together quickly and be on my way. VOILA! 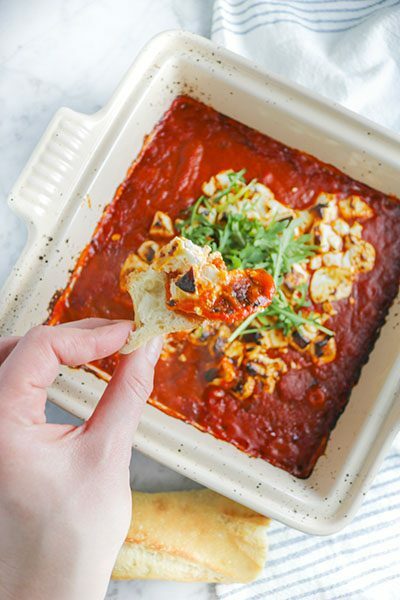 Enter this fab Baked Goat Cheese Marinara Dip. 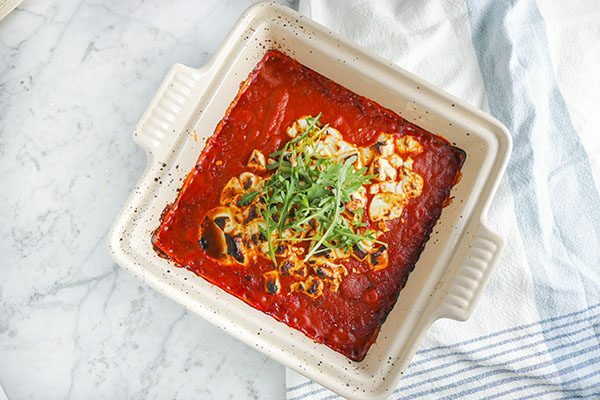 Creamy, rich goats’ cheese, perfectly balanced by zesty marinara. As I mentioned, its only TWO ingredients. Simply pour, top, bake – and you’re done! I usually like to serve this dish with freshly baked bread – a French baguette or ciabatta are always excellent choices, but feel free to use whatever you have on hand! 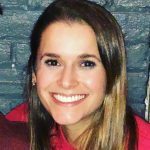 I actually really enjoy being the half-baked pieces of bread at the grocery store – have you seen those? All you have to do is bake them for about 10 minutes, and they taste INCREDIBLE! Almost homemade! What’s better yet? You can make this appetizer in any quantity – looking for a quick dish for date night? 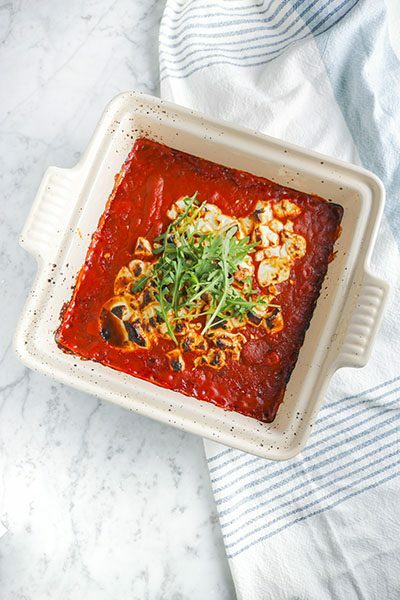 Use half a jar of marinara and a baby log of goats’ cheese (4 ounces). Have leftovers? Throw them on top of some pasta or pizza crust and enjoy for lunch the next day! 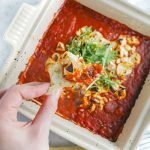 Creamy, rich goats’ cheese, perfectly balanced by zesty marinara – this TWO-ingredient Baked Goat Cheese Marinara Dip is equally easy and impressive! Preheat oven to 350F. Lightly grease a square baking dish, set aside. Pour marinara into dish, spreading evenly throughout. Slice or crumble goats’ cheese over marinara. Bake covered at 350F for 15 minutes, uncover and bake for an additional 5-10 minutes until cheese begins to brown. Serve warm with freshly sliced bread.